Whether it's your food, gift, or main table this is an area where you can really play up your theme. There are tons of clever budget friendly tricks you can incorporate. Table Covers. If you're an event planner or have many years of birthday parties to come I would suggest that you purchase some decent table clothes that will last for years to come. My favorite vendor is LinenTableCloth.com. They have great prices and excellent customer service. An alternative is purchasing plastic table covers, these are great for one time use and are very inexpensive. Visit my store for some great deals and selections. I'd suggest that you buy multiple coordinating colors that can be used for swagging and draping in addition to table covering. Forks, plates, cups, spoons, knifes, oh my! Choose cutlery and place settings to coordinate with your event's theme and color palette. For an really elegant touch purchase gold or silver flatware. TIP*** A really neat trick for customizing your cups is to purchase clear cups in bulk (we all know how many cups kids use at parties) and apply matching stickers or tattoos to each cup. For extra durability cover the stickers with a coat of modge podge. Time to let the magic happen! Now it's time for your creativity and imagination to flow. Your table centerpiece and accents can be as elaborate or as simple as you choose. You can add table runners, boas, tulle, confetti, ribbons, and more to your table as a back drop to your centerpiece. For a centerpiece be creative! 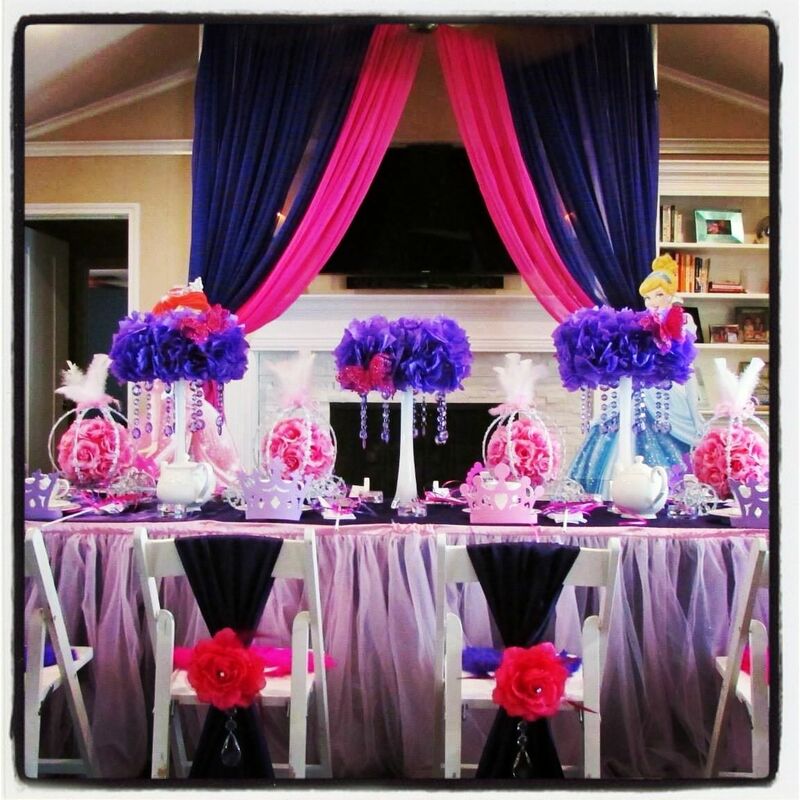 Store bought pop-up or cardboard centerpieces can work, but you are planning the Ultimate Princess Party! Can't wait? Follow me on Pinterest for inspiration!